Parks & Trails Council of Minnesota’s Legislative Committee develops and implements our legislative priorities in preparation for each session of the Minnesota Legislature. Committee members actively engage in legislative advocacy at the state capitol and in their communities and promote P&TCM’s priorities by writing letters, calling legislators, and engaging targeted members of local communities. 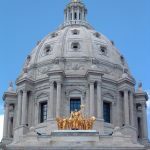 The main website for the Minnesota Legislature allows you to search statutes by keyword, check the status of bills making their way through the current session, and get answers to frequently asked questions about the legislative process. 14.25% – Parks and trails fund. The legislature has created a website to help citizens track the ENRTF, which is a dedicated fund passed by Minnesota voters in 1988. The money in the fund originates from a combination of Minnesota State Lottery proceeds and investment income. The purpose of the ENRTF is to provide a long-term, consistent, and stable source of funding for activities that protect, conserve, preserve, and enhance Minnesota’s “air, water, land, fish, wildlife, and other natural resources” for the benefit of current citizens and future generations. Recommendations for which projects are funded through ENRTF are made by the Legislative-Citizen Commission on Minnesota Resources.